I thought I'd tell you a bit more about my new machine. It's a JL (John Lewis) 330 - essentially a Janome and takes Janome parts. As an exercise in getting to know know it I've finished off the crazy patchwork piece I started at the Stitch Gathering. I am now quite smitten with this technique as well as the new machine. Apart from the price, which was in the right bracket, it has a few features I was especially looking for. 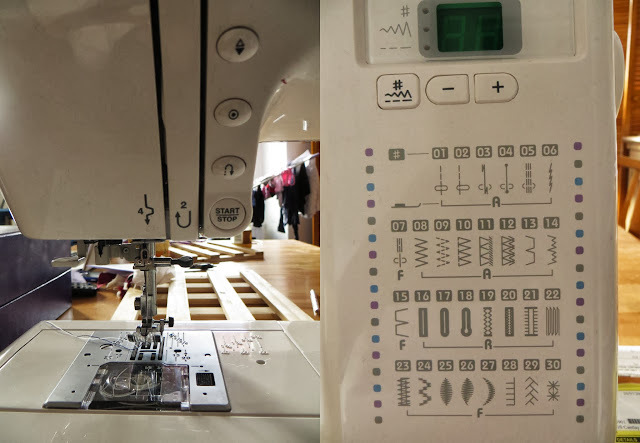 One is the ability to press a button and start or end sewing with the needle in the up or down position - no more cranking the wheel, and easy pivoting turning when changing direction on a corner. It also has an automatic thread lock button, so you can sew a few stitches when starting or ending a line, which will save me a huge amount of faffing around pulling through threads and tieing them off. If you set the thread lock button when using a decorative stitch the machine waits until it has completed a stitch before tying off - clever. Add to this a sensitive food pedal which allows you to crawl along almost stitch by stitch, and a speed over-ride dial which means you can set the top speed you want to go at. Perfect. It has a bewildering array of button holes which I am unlikely to ever use, but I like the blanket stitch for applique. I also love the fact that the bobbin is located under a clear hatch so you can see how full it is. Yes, you will have to excuse the laundry drying in the background. I also tried out some of the decorative stitches - you can see here a scallop, feather, and bobble (can't remember its name:-)) stitch and you can just make out in the smaller cream triangle that there are some little star stitches. These can be sewed in a row, but using auto thread lock meant I was able to do one at a time and use it as a tying stitch. I tried a bit of quarter inch quilting on the cream silk, and on the slippery wine-coloured lining fabric and it sews a lovely line - this might sound odd, but it was a revelation to me because my old sewing machine used to throw in the odd wobbly stitch, I don't know why. So anyway, I have tested it, and have finished something! Weyhey! I really loved making this, though hand-stitching any of it, as we did at the Gathering, doesn't work for me as I seem to be incapable of stitching in a straight line without introducing puckers. I would probably use a foundation cloth too, especially with a fine fabric like Liberty, and an all Liberty crazy patchwork project is what I'm on to next. It sounds like love at first stitch! Yay. Lovely - now you will be addicted to crazy patchwork no doubt? I am interested to hear about the quilting part as that is something my old machine baulks at. Must go and check that machine out methinks! Oh I love that feather stitch. That looks like a lovely machine, and i like your patchwork piece. Looks like you are having fun with your new machine! Sorry, I couldn't help it. The machine looks great. Even though I've owned a sewing machine for 4 or 5 years now, I still consider myself new to sewing (it's far from an every day event for me). I wouldn't know what to do with a machine like this, I would probably still stick to the two main stitches I use now :) You've done a great job experimenting. So glad you love your new machine! I had similar revelations when I got given the MemoryCraft - needle down and the sensitivity of the foot pedal having the biggest impact. Last night I even sewed my first button hole (and it has a nifty foot that you put the button in and it automatically works out the size of the hole, how neat!!). And I really need to try crazy patchwork, your block looks so cool. Yipeee for a new machine!! The crazy patchwork is beautiful too! My there are a lot of buttons... the decorative stiches and your piece are both lovely. Fun for me to see what a 'real' sewing machine can do - mine is both ancient and basic.